Glaucoma - body, causes, How Does Glaucoma Affect the Eye? Glaucoma (glaw-KO-ma) is a group of disorders that cause fluid pressure to rise inside the eye, which may result in vision loss. If a balloon is slowly filled with water, eventually it will burst. But if the same balloon has several pin-sized holes at one end, then it becomes possible to continue adding water to the balloon to maintain its round shape, without breaking the balloon, as long as the amount of water being added is equal to the amount escaping through the pinholes. The eye has a similar system of liquid that continuously flows in and out of a small chamber at the front of the eyeball. The problem for people with glaucoma is that the drainage out of the eye is blocked or not working properly. It is similar to the balloon that is filling with water. Without a way to make room for more liquid, pressure builds up. Although a pressure buildup will not cause the eye to burst, it may damage nerves at the rear of the eyeball that carry images to the brain. Glaucoma is one of the leading causes of blindness in the United States. It affects more than 3 million people, especially the elderly and people of African ancestry. The disease also is one of the sneakiest eye disorders. Pressure can grow in the eye for years before the effects on vision are noticed. By then, often the damage has been done. Anatomy of the eye. The arrows show the flow of aqueous humor from behind the iris, through the pupil, to the front of the eye, where it drains through the canal of Schlemm. The eye is about the same size as a ping-pong ball and is divided into two compartments. The larger compartment at the rear of the eye contains a gel-like substance called vitreous (VIT-re-us) humor, which helps to maintain the eyeball's shape and to transmit light. The front compartment, or anterior chamber, is smaller and is filled with a watery liquid called aqueous (AY-kwee-us) humor. This clear liquid brings in nutrients vital to the eye's health and carries out waste that can damage it. The aqueous humor flows from behind the front colored portion of the eye, which is called the iris. It moves through the pupil, the opening in the center of the iris, into the front chamber of the eye. The liquid flows through the chamber and out a tiny drainage canal that has a fine, mesh-like covering. The small hole on the canal rests at an angle where the colored iris meets the cornea, the clear cup-shaped disc at the front of the eyeball. About 90 to 95 percent of people with glaucoma have a problem with this drainage system. The cause is unknown, as there is no visible blockage. It appears that the cells in the mesh covering the drainage canal do not do their job properly, or lose their ability to allow proper drainage over time. Glaucoma develops gradually, but there is a rarer acute * form of glaucoma that develops suddenly when the iris closes off the drainage canal. This causes a painful medical emergency that requires immediate treatment. The cause of most cases of glaucoma is not understood, although people of African ancestry, people who have diabetes or other family members with glaucoma, or those who have suffered eye injuries are at greater risk. Aging is another risk factor for glaucoma. Except for the rare cases of acute glaucoma that develop suddenly, most people do not realize they have glaucoma. As pressure is building in the eye, many of the millions of nerve cells at the rear of the eye are destroyed. 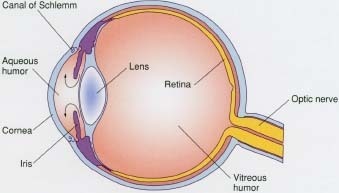 The nerves that die first affect peripheral (pe-RIF-er-al) vision, or how well people see out of the sides of the eyes. When the loss of vision becomes severe enough for a person to notice, the damage is so great that little can be done. The best way to diagnose glaucoma is through an eye exam that uses an instrument called a tonometer (to-NOM-e-ter) to measure the pressure in the eye. One type of tonometer registers eye pressure by lightly touching the eye's surface. Eyedrops are used to make this procedure painless. Another tonometer uses a puff of air to measure eye pressure. The doctor or eye specialist (ophthalmologist or optometrist) also may use a scope that shines light in the eye to look for damage to the optic nerve. Peripheral vision can be checked as part of the eye exam. * acute means sudden, short, and severe. Why Are Early Diagnosis and Treatment Important? Early diagnosis of glaucoma is the key to preventing vision loss. If glaucoma is discovered before the increased eye pressure has destroyed many nerves, vision can be saved in many cases. Routine eye exams, including tests for glaucoma, are important, especially as adults pass age 35. Such eye exams are especially important for people at greatest risk for glaucoma, including people of African ancestry, people with relatives who have glaucoma, people with diabetes, and people with previous eye injuries. The most common treatment involves eyedrops that reduce pressure. Sometimes surgery is necessary either to open the drainage canal or to create a new one. Glaucoma rarely occurs in young people, but Erik Weilenmayer was born with an eye disease that caused glaucoma. By age 13, he was totally blind. Erik did not let glaucoma prevent him from becoming a teacher and a mountain climber. He has scaled some of the toughest peaks, including Alaska's Mt. McKinley, the highest in the United States. "When I first went blind, I wondered what I could do," Weilenmayer said in 1998. "It's really a kick to do extreme activities and do them well—and no more dangerously than anyone else." Erik's accomplishments are a reminder that physical challenges and differences do not have to prevent people from participating in life's most difficult and demanding activities. Glaucoma Research Foundation, 200 Pine Street, Suite 200, San Francisco, CA 94104. The Glaucoma Research Foundation offers helpful publications about glaucoma, including Childhood Glaucoma: A Reference Guide for Families. The U.S. National Eye Institute posts a fact sheet about glaucoma at its website. A note on - \"How Is Glaucoma Diagnosed?\"
The newest method of obtaining intraocular results is through the eyelid by using Diaton tonometer. Diaton does not require contact with cornea. Diaton tonometry requires no anesthesia and no sterilization, since results are obtained through the eyelid; this method of tonometry presents minimal, to no risk of infection.